Herein is the second corner of the Pen & Ink worksheet with suggestions from viewers to “The House That Jack Built” project. This is a camera shot rather than a digital scan so coloring is different from the previous “2nd corner” post. 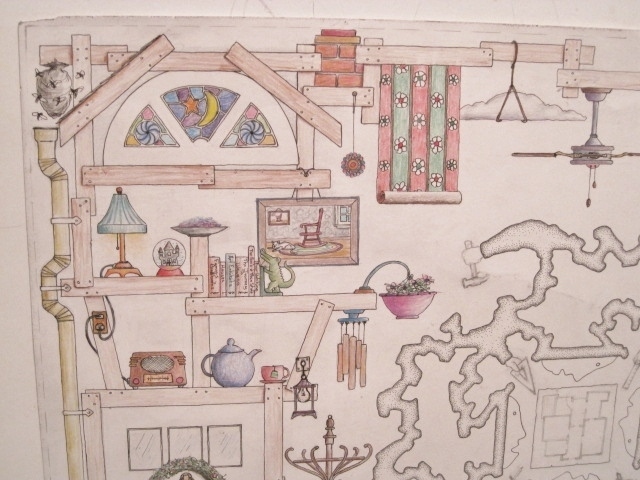 An example of this-Ivy was suggested for the Second Corner and I have decided to add this to the Fourth Corner area. A cat was suggested in the First Corner posting, I have used it in the Second Corner “framed painting with the rocking chair”. Next week I will post the Third Corner with areas to be considered and look forward to additional suggestions. Today, Monday, July 28; Second Corner with suggested items. Thanks, Karen. I saw a couple of other comments about having trouble with “cut and paste”/uploading to the comment box on the Week Eight post. I don’t know if that’s your comment or a message from WordPress. Anyway, I will check to see if it’s something on my site that is of issue.